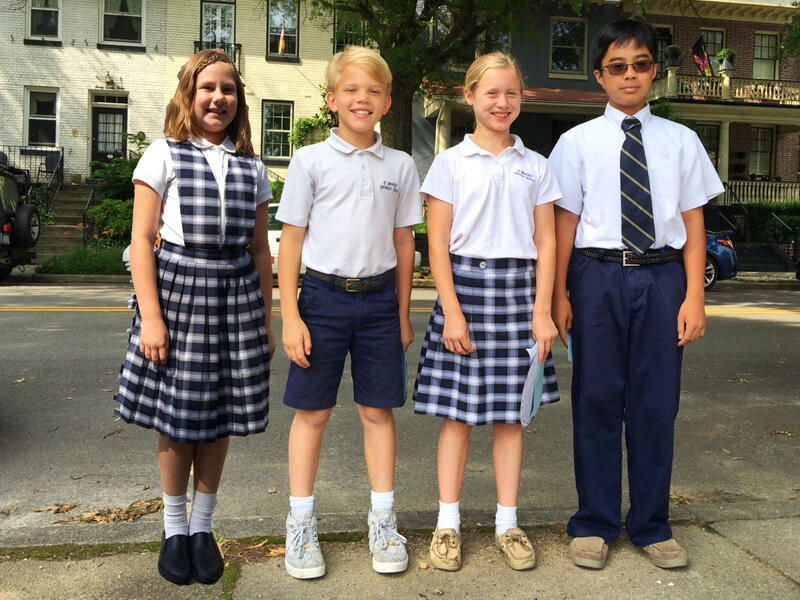 The uniform is a tradition of Saint Benedict Catholic School and is worn by all students except Pre-Kindergarten. The uniform embodies a sense of community and allows students to focus on the task by hand. It is the responsibility of the parents to help make sure that all children wear the proper uniform. If a child comes to school with an improper uniform, they will be asked to correct the uniform, and they will receive disciplinary consequences. If an item is missing or cannot be removed, the parent may be called and the student’s uniform must be corrected before they may return to class. Any work missed must be made up after school. Our official uniform provider is Flynn & O’Hara, 9722 Midlothian Turnpike, Richmond, VA 23235 or by way of www.flynnohara.com Uniform items may also be purchased from other sellers as long as they meet the uniform guidelines. The PTO collects used uniforms and sells them for $2/item. Dates of sales will be announced in the weekly newsletter. Platform shoes, boots, clogs, and cover-­the-­ankle shoes are NOT permitted. Heels on shoes may not be higher than 1 inch. Tennis shoes and hi-­tops may be worn for PE class only. Boots may be worn to school in inclement weather only and should be removed upon entering the school and be replaced with proper footwear. Fleece Jacket - The fleece jacket, pullover or zip­-front, with the school logo may be worn as part of the school uniform on any school day. Sweatshirt - The navy sweatshirt with school monogram may be worn ONLY​ with the PE uniform. Hair​ - Must be neat with boys’ hair above the collar, above the ears, and not covering the eyebrows. Fad hairstyles and dyes are not permitted. Girls’ hair should be kept out of the eyes. Girls must only wear black, white, navy or school plaid hair accessories with hair bands less than 1 ½ in. wide. Hair bows should follow the school color scheme and be moderate in size. Jewelry​ - Should be kept appropriate to a Catholic environment. A small watch may be worn. No elastic bands, FitBits or “smart” watches are permitted. Make­up: ​Make­up or nail polish may not be worn at any time.